We love to clean Windows! Home owners, property managers, builders and business owners throughout Nampa and Caldwell. Have your windows, frames, tracks and screens detailed, your hard water removed. Keep your windows looking fantastic! We are neat, clean and respectful of your property or business. 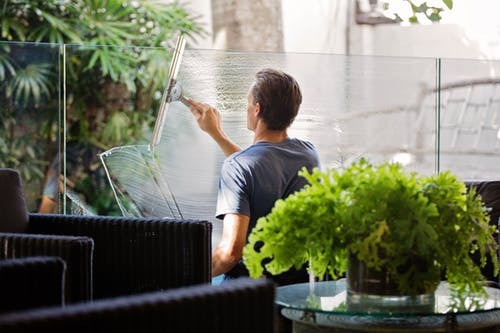 When choosing a professional window cleaner and looking at window cleaning companies, make help make sure you’re choose the best window cleaner in town. We specialize in commercial window cleaning. Our commercial window cleaners are experienced, trained, and have all the necessary equipment and safety devises to ensure the squeaky-clean shine of your office or commercial building. Years of hard-water building up on your windows can cause permanent damage. Help protect your windows with our hard-water removal and micro-barrier services.